Lemon meringue pie is a favorite dessert for many people, especially as the weather gets warmer because the lemon flavor is so refreshing. Lemon meringue pie can be intimidating if you’ve never tried to make a meringue, though, because meringue looks harder than it is. One way to cut down on the work is by making a fast lemon meringue pie with an easy pie crust and filling that lets you devote the most time to making perfect peaks. A commercial pie crust will work for lemon meringue pie but it’s even more delicious if you make your own. An easy and quick pie crust can be made by crushing half a box of graham crackers and mixing them with one stick of butter that you’ve allowed to soften at room temperature. Mix the two together, cover the bottom of the pie pan and bake for ten minutes at 350 degrees. This is a delicious pie crust that tastes great in lemon meringue pie or any of your favorite pie recipes. Next make the pie filling by combining a lemon pudding mix like Rawleigh’s lemon dessert mix with ¾ a cup sugar, 3 cups water, 3 tablespoons of lemon juice and three well-beaten egg yolks (separate the egg whites and save them because you’ll need them for the meringue). Cook according to package directions and pour into your baked piecrust. You can also add some grated lemon zest to your lemon meringue pie to give it even more of that fresh flavor. To make the meringue, beat three egg whites with ¼ a teaspoon of cream of tartar using an electric mixer. Add five teaspoons of sugar gradually and keep beating until stiff peaks form in the bowl. 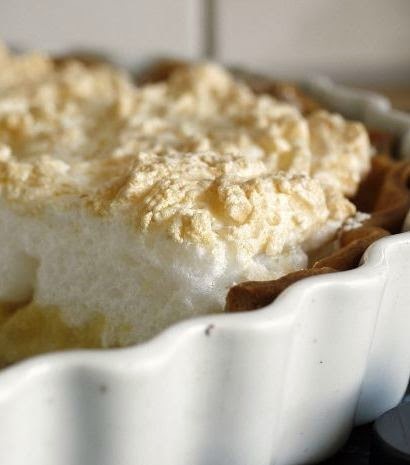 Spoon the meringue on top of the rest of the lemon meringue pie, and bake for 15 minutes at 350 degrees in a preheated oven. Let the pie cool before serving (it should be ready in an hour or two). Add more egg whites and cream of tartar if you want a higher layer of meringue on your pie. You can also dress up the lemon meringue pie by adding Cool Whip and candied lemon slices on top when the pie has cooled off.